Translate any page on this web site with Microsoft Translator at the bottom of each page. "Click on area of interest below"
Starting in 2014 we will be posting that we receive from our guests. I request from all guests, after their stay at an individual Island House, to email me their comments with regards to their stay. Some of these replies are received directly from the owner from the Guests and forward to me. Remember not all guests return my request, for what ever reason. These are actual "Comments" (unedited) emailed to us from our Guests. Guest also post directly on Trip Advisor directly. This was one of the best Christmas trips we have taken. When we arrived at Kai Kotch, we found a Christmas card and a welcome gift waiting for us. The house and location were great. We really enjoyed our neighbors in our little community. We met several at our pool... from Michigan....New York... Texas Turns out our neighbors from Texas... one was a Track Coach for the University of Texas... given my sister is a huge Longhorn fan, we had a great time with them. The house....... beautiful and well equipped... it had most everything you could need . Most of our awake time was spent in the screened in porch just relaxing and listening to the wind blow through the trees. I was amazed on the only afternoon where the sky seemed to open up with a downpour and high winds, we stayed nice and dry in our favorite area. We initially rented Kai Kotch for its proximity to Rum Point. It was nice to walk across the street for our two excursions and the night time walk out to the pier to see the young tarpon (some 4ft long) hanging around the lights, but it was a little too commercialized for us ( drinks were pricey too). The best use for this location was to load up the rolling cooler (provided at Kai Kotch :) ) and drive down the street to Star Fish point. there is a vacant lot you can park and walk the 100-200 meters to the point. it was great to mix with the various tours that ran in and out of there and enjoy the music, people watching, and enjoy your own self-brought bargain drinks! We ended up visiting several times during our trip... one of our favorite places . On the last visit, my son brought his hammock and tied it to two coconut tree on the beach..... talk about your Caribbean dream. Though Cayman Kai is a ways out, we came to enjoy the piece and quiet and the slower way of life. I can see how people are attracted to move to this beautiful island. We were looking for a relaxing place to stay as a family with 3 teenagers. We rented a big car thinking in a week full of traveling and exploring. Finding this place so peaceful and beautiful, our children did not want to leave Rum Point and we stayed there the whole time, just swimming, snorkeling and enjoying every night the bioluminescence on the cove with the kayaks . My husband drove 3 minutes every morning to fish at the star fish beach, which we also loved. We booked a trip on a boat starting at Rum Point to see the stingray city just 13 minutes away. Highly recommend this as well. The place was big enough to rest and enjoy our time as a family. The owner was very nice and helpful with all the information and details we needed. The house was equipped with lots of snorkeling gear, we had brought our own, but if you do not have one, you will find more than enough. The grocery store is 20 minutes away and it is very small. If you rent a car it is easier to stop at the big grocery store close to the airport and buy your food there. The restaurant at Rum Point is excellent but the prices are high for a big family to eat there every night. This was our best beach vacation ever and we hope to come back in the future. Recommended for: Romantic getaway, tourists without a car, sightseeing, families with teenagers, adventure seekers, families with young children. This is a lovely place. We LOVED the cove and were steps away from the incredibly beautiful Rum Point beach. The snorkeling was exceptional though the current is very, very strong. The lanai is great for an afternoon of relaxation and everything we needed was there. Thank you Tim for the great vacation. Recommended for: Romantic getaway, people with disabilities, girls getaway, age 55+, families with teenagers, families with young children. We stayed here with our two young children and were pleased with the house, as well as the proximity to Rum Point, where the kids loved to play. We also got to check out the bioluminesence on the lagoon a few nights in the kayaks and that was a new and memorable experience for all of us! Thanks for a wonderful vacation! This was our 2nd time at Cayman and we love this side of the Island. The house worked very well with three younger children (<11 yrs) and two adults. To have use of the kayaks and paddle boat was great. The lagoon is located right behind (100 yards) the house and can be seen from the screened lanai. Walking to the beach takes only a couple of minutes. The beach is beautifully located with various trees providing shade if you want. You can rent all kinds of fun stuff with Red Sail company and our kids had a blast every day at the beach. Getting around the island is very easy from Rum Point: you could take the local bus, or use a rental car. Thanks for sharing your house with us and we certainly hope to come back next year again. Recommended for: Romantic getaway, girls getaway, sightseeing, age 55+, families with teenagers, families with young children. Thank you SO MUCH for what I have described to my friends and customers as a perfect vacation! From beginning to end, everything so exceeded the norm that I can't find enough superlatives to do you guys justice! The villa is extremely comfortable with space for both gathering and solitude. And the "toys" are great! All four kayaks and the paddle boat are high quality, the snorkeling gear is excellent and plentiful, and the indoor and outdoor games were thoughtfully chosen. We loved the Rum Point area! There was plenty to do and we were close to amenities, but we felt like guests rather than tourists. 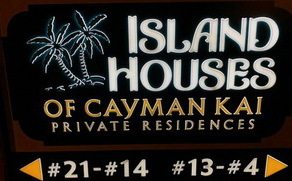 Robert at Cayman Kai Vacations was professional and very helpful, and we especially appreciated your checking in with us during our stay to make sure everything was just right. "Exceeds expectations" just sums up what a guest at Kai Kotch will experience! A few recommendations for your stay: My daughter did her dives at Ocean Frontiers and found them remarkable. It was an easy 30 minute (or less) drive and they were on schedule to the minute all 3 days. We tried the newly reopened Rum Point Restaurant and it was great! There is what I think might be a new Fosters mini-store, liquor store and bakery across from Morritts which gave us one stop shopping in a very easy and scenic 20 minute drive. The Bodden Town Art Shop was a super place to shop for mementos and we were pleased that everything was made on the island. And okay, it was already on the list but Roland's Garden was the best and most unique place we have ever eaten, and my daughter and her boyfriend are devoted DC foodies so that's saying a lot! Loved your house! The set up worked well for us and looks great. Location is wonderful very quiet and private, but a short walk across to beaches, water sports, and food. The cove at night is something I'll never forget. The bioluminescence is incredible and I'm thrilled we got to see it. The choice of boats at the house is great. I think we used all of them. Thank you for all the information you provided from our first contacts through our stay. If we return to Grand Cayman would love to use the house again. Thanks! Had a very relaxing time. Accomodations were splendid, as were the temperature, and amenities. Georgetown, and 7 mile were a good distanc away, as were the huge crowds. (THANK-YOU). Beach is a short 2 min walk, and the clean conditions are 2nd to none. I'll be back soon. Guest F. & B. M.
We had a great time on our 'North Side' vacation. Very relaxing & peaceful. We loved the kayaks & paddle boat. Hope to be back next year! We stayed two weeks at Kai Kotch #17 and were very pleased. The house was redecorated before we arrived and was everything promised and more! By the third day we were calling it home-it had everything we needed. They include four kayaks and a pedal boat, snorkeling gear, beach towels, free calls to the US, the list goes on and on. The complex has a pool, a boat dock, and adequate night lighting. The location is wonderful-perfect for people wanting to get away from it all, yet a walk across the yard and across one street and you have access to water sports, food, and beaches. The cove is really special. They have kayak tours to the area to see the bioluminescense that you can see every night (given the right conditions) and the kayaks included with the house. It was truly a unforgettable experience. It felt good to be amazed again! The owners are easy to work with, respond quickly, and are very helpful. Starting with their personal web site which has a wealth of information and extending through our stay, we were given information on the entire island. As all the houses are separately owned their timely responses and web site really sold us. Had a wonderful stay and absolutely recommend this area and their house in particular. in the Cayman Kai/Rum Point area, Grand Cayman, Cayman Islands.